Sea lamprey researchers measure stream velocity and discharge in the Carp Lake River to determine the appropriate concentration of alarm substance to apply. Photo: Tom Luhring, Michigan State University. That researchers are now studying how to chemically manipulate sea lamprey behavior, reminds me of the early DuPont chemical company advertising slogan: “Better Living Through Chemistry.” That old saw came out in 1935. The chemical industry was trying to sell the American public on the benefits of plastic, among other things. Today, we might utter the same as a snarky comment about chemical contamination of our waters. But, there is a kernel of truth in those words. Chemicals are now used to control sea lamprey. One, widely used in Michigan, is called TFM. It is considered reliable and reasonably effective, but expensive; and researchers are experimenting with other compounds, to see if sea lamprey behavior altered in ways that could eventually eliminate the need for TFM, or reduce its use. 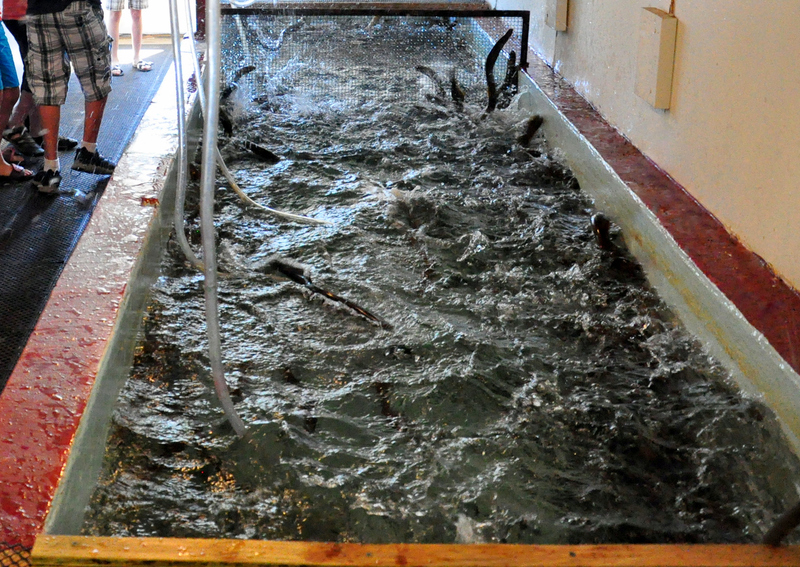 Captive sea lamprey (in a laboratory raceway) respond to the alarm substance added to the water. The alarm substance greatly increases the activity level of the sea lamprey, even causing some sea lamprey to jump out of the water. Photo: Andrea Miehls, Great Lakes Fishery Commission. compounds with odors that are attractive or repugnant to lamprey. They want to know whether the parasitic marine animals can be guided up certain streams and kept out of others – or motivated to avoid one side of a stream while being attracted to the other and into a trap. Various parts of the research have already shown potential in limited field tests. “We can’t assume that the animal will jump through hoops of fire for us,” says Mike Wagner, assistant professor at Michigan State University School of Fisheries and Wildlife, the lead researcher on the projects. “We (still) have to craft the right way to present it, and determine the correct geographical and seasonal circumstances needed to get the right outcome. Wagner’s research is being conducted in partnership with the Great Lakes Fishery Commission (GLFC). The work is funded by the U.S. EPA, through the Great Lakes Restoration Initiative, in concert with funding from the fishery commission. A female sea lamprey (marked with various identifying tags) migrates upstream, attracted to a male pheromone. Photo: Andrea Miehls, Great Lakes Fishery Commission. 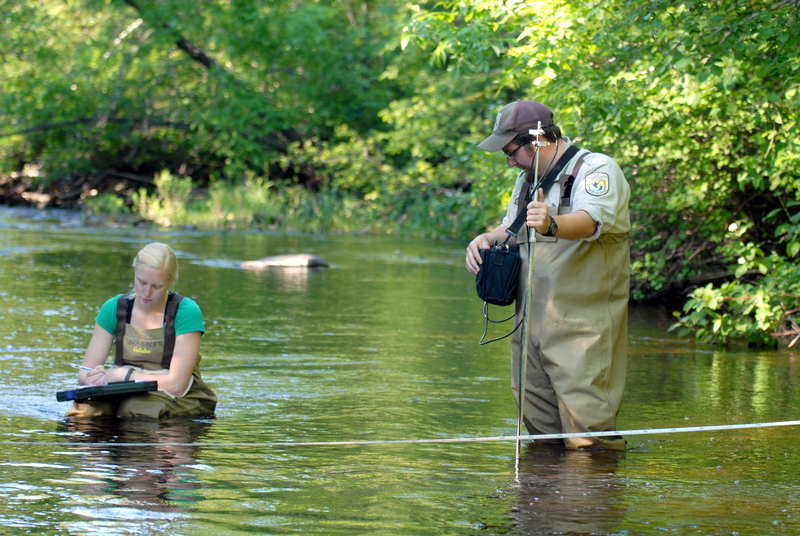 Research planned for this summer takes place on tributaries of the Jordan and Manistique rivers, and the Ocqueoc River, along with the Carp Lake River outlet in Mackinac City. The Jordan and Manistique studies will examine whether lampreys can be deterred from going up one of two tributaries where they come together. Researchers plan to release “alarm cues,” on one branch, a compound given off by dead lamprey that is noxious to live ones. Research to date shows it is not completely effective as a chemical barrier on a river, but Wagner and others want to know if it might prompt lampreys to choose another tributary when one is available. 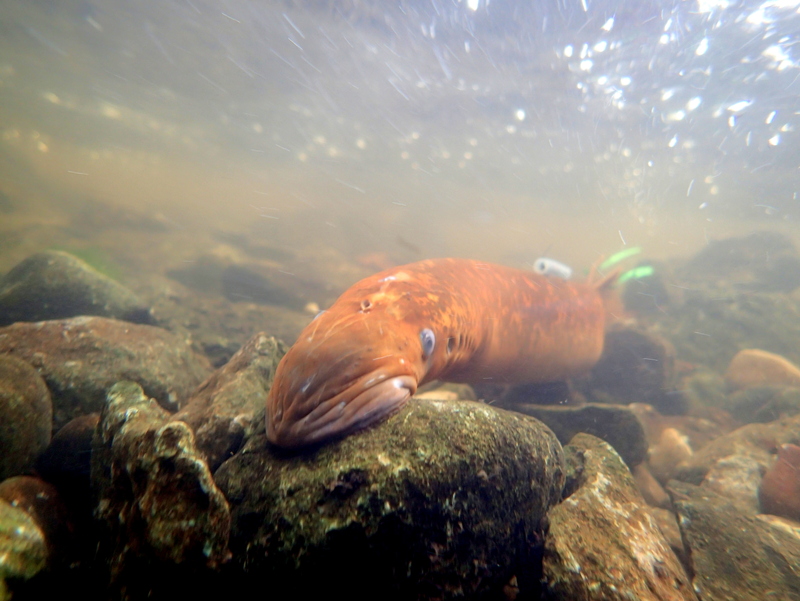 If the tactic shows promise, it could be used to direct lamprey up tributaries with less favorable spawning habitat, and thus reduce spawning success. At the Carp Lake outlet, researchers plan to conduct what they call a ‘push-pull’ test, using good smelling (migratory or mating pheromones) on side of the stream and bad-smelling compounds (alarm cue) on the other side to direct lampreys into traps near the lamprey barrier on the river. Similar push-pull tests are also planned on the Ocqueoc River to see how the approach might be used in other ways. Co-investigator, Mike Siefkes, the GLFC sea lamprey control manager, said trapping efficiency across the Great Lakes basin is low, about 40 percent. If the pheromone research can help improve that, the benefits are twofold. Congress currently appropriates $21 million annually for Great Lakes sea lamprey control. GLFC staff report that the problem requires more like $25 million. Pheromone research looks to have real potential as a control agent that could reduce those costs. This, of course, brings us back to DuPont. This entry was posted in Uncategorized and tagged Conservation, Environment, Fishing, Great Lakes Fishery Commission, Great Lakes Restoration Initiative, Nature, Rivers, Sea Lamprey, U.S. Fish & Wildlife Service, US EPA. Bookmark the permalink.